Stroke 1) Open your round with a 3-Wood, hitting slightly to the right side of the fairway. As there is a gentle downhill slope your ball will have the advantage of the roll depending on the condition of the ground. (Stroke 2) Use a Wedge to take you up to the pin that still lies below. (Stroke 1) As the hole is gently uphill use a Driver off the tee and aim for the right side of the fairway. (Stroke 2) A 3-Wood will bring you a little short of the green. When lining up for the stroke aim lightly to the left of the green. (Stroke 3) A Pitching Wedge will place you close to the hole whilst too much firmness in the shot will be compensated by the ridge lining the back of the green. (Stroke 1) Use a 3-Wood aiming to the right side of the fairway towards the protruding group of trees. (Stroke 2) A firm 6-Iron will place you on the green. (Stroke 1) This challenging par-3 hole requires a 5-Iron. To carry the water aim to the left of the pine ree that is in your line with you and the green. The accuracy and distance are all important as a bunker lies across its entrance. (Stroke1) This par-5 hole leading back to the clubhouse requires a firm Driver off the tee straight up the fairway and avoiding the far right side as it is "Out of Bounds". (Stroke 2) Use a 5-Wood and try not to land short on the left side as this position will leave you with a very challenging next shot. (Stroke 3) A Pitching Wedge will take you up to the hole. (Stroke 1) For this par-3 hole that lies invitingly below you a 3-Iron is recommended. Avoid the right side of the green due to the slope. (Stroke 1) A Driver will place you well up and aim for the left side of the fairway to be in a good position for the next shot. (Stroke 2) Use a 7-Iron and aim for the left side of the centre of the green as there is slope to the right. 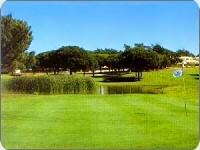 (Stroke 1) The Driver will place you well up in the fairway on this par-4 dogleg. Ideally, aim slightly to the right side of the fairway. (Stroke 2) A 3-Iron to the left of the centre of the green should be the correct approach shot to this gentle uphill slope. (Stroke 1) Use a 5-Wood aiming to the left of the bunker on the right side of the fairway. (Stroke 2) Select a 9-Iron and aim to the left of centre of the green taking into consideration the position of the flag. (Stroke 1) This challenging par-3 hole requires a 5-Iron basically to the centre of the green. Club selection and quality of shot is imperative as there is lots of trouble on all sides of the green. (Stroke 1) A 3-Wood aimed straight between the two fairway bunkers will place you well for the approach shot. The landing area is narrow due to these bunkers. (Stroke 2) Use a 4-Iron to take you to the left of the centre of the green. (Stroke 1) In order to play this par-5 dogleg you need a good drive off the tee with a Driver. Aim to cut the trees and the protruding bank on the right side of the fairway. 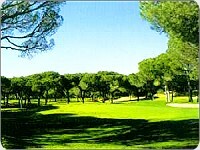 (Stroke 2) As it is uphill from here you will need a firm 5-Wood avoiding the bunker on the right. (Stroke 3) Select an 8-Iron and aim to the middle of the green. (Stroke 1) As this is a dogleg to the right use a 5-Wood to take you over the trees protruding on the right side of the fairway. (Stroke 2) The 6-Iron will take you to the centre of the green and as near to the pin as possible! (Stroke 1) This hole is a dogleg to the left and requires a straight drive with a Driver aimed between the two bunkers on the fairway. (Stroke 2) A 3-Wood should bring you to a position that is a little short of the green. (Stroke 3) Use a Pitching Wedge to lift you up and on to the green. (Stroke 1) The hole can be deceptive as the green is very short in length so club selection is very important - suggest a 6-Iron, depending on the prevailing wind. (Stroke 1) This hole is the longest par-5 on the course with a curving dogleg to the right. Use your Driver to carry the trees on the right hand side of the fairway. (Stroke 2) Use a 5-Wood to carry a further group of pine trees again on the same right hand side. (Stroke 3) With a 9-Iron let your shot avoid the actual bunker in front to the left but placing the ball somewhere close. With this position you will have a clear shot towards the green. (Stroke 1) Use your Driver and avoid the bunkers on each side of the fairway. (Stroke 2) A 4-Iron should take you to the middle of the generous green. (Stroke 1) As this is an open fairway a straight shot with a 3-Wood to the middle will achieve the ideal position. (Stroke 2) Use a 7-Iron to pitch you onto the green followed by a good putt that will take you back into the clubhouse for a rewarding drink!